Gymnastics on the Grand proudly presents our signature event, the Optional Event Finals. This is a unique opportunity for the top five gymnasts on each event at the top levels of competition to compete head-to-head. 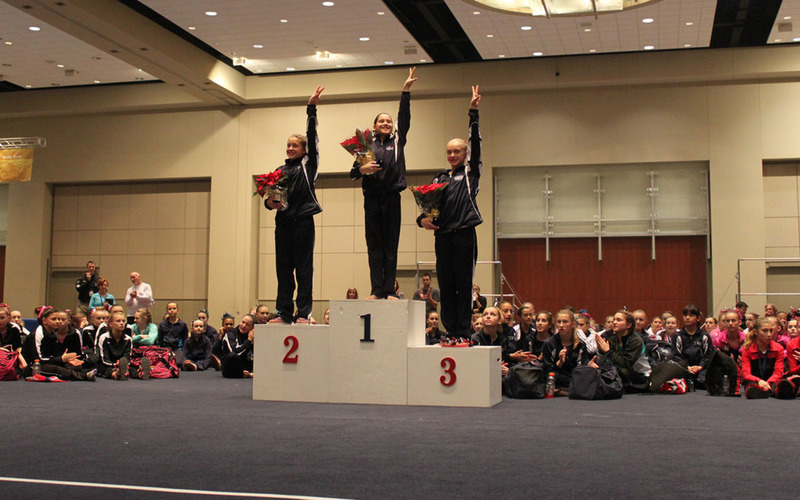 At event finals, spectators will have the privilege of watching some of the most talented gymnasts in the Midwest compete in their top event. All girls competing Level 7, 8, 9 or 10 are eligible to qualify for event finals. Once all Level 7, 8, 9 and 10 gymnasts have competed their regular competition session, all scores will be ranked. Age classifications from 2013 are listed below for reference. 2014 age classifications will be based on the actual ages of all gymnasts registered at each level. The five gymnasts scoring the highest in each event at each age classification will qualify for the event finals. A gymnast may participate in multiple events if her score on each event qualifies her to do so. Individual Event Specialists may qualify for event finals as long as 1) they are entered in the regular competition as an I.E.S. and 2) their score in the qualifying session ranks in the top 5. The Finals Event will be “New Life”. The qualifying gymnasts on each event will go head-to-head against each other and re-rank during this competition. Qualifying gymnasts will be announced at the conclusion of the awards for the last level 7, 8, 9 and 10 session. The coaches of the qualifying gymnasts must confirm participation of the gymnasts to GRG Coach Shane within 30 minutes of the announcement of qualifying gymnasts. All participants in the event finals will warm up and compete together by level. Each level will begin on a different apparatus. The order of competition for each event in the finals will be determined by a draw. Each qualifying gymnast will receive an Event Finals duffel bag. Event Finals crystal trophies will be presented to the three top-scoring gymnasts in each event at each level and age division.